Reinvent a round box or glass jar as a glamorous container for your boudoir, complete with beaded fringe and decorative pin. Keep jewelry and other essentials in this fancy box. This project is an excerpt from C&T Publishing Color Your World with Princess Mirah Batiks. Round box or jar with lid- Maximum box/jar diameter is 33⁄4˝. 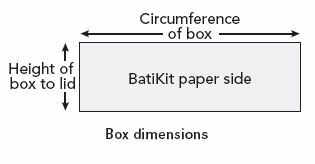 Trace the bottom of the box onto the paper side of one of the BatiKit sheets. Cut it out. With the box lid in place, measure the height of the box just up to the lid. Measure the circumference of the box. Transfer these measurements as shown onto the paper side of the other piece of BatiKit and cut it out. Remove the box lid and set it aside. Remove the paper backing from the BatiKit fabric pieces and fasten them to the box. Lay the silk satin piece on your work surface, wrong side up. Center the lid on the fabric with the inside of the lid down. Apply glue around the side of the lid. 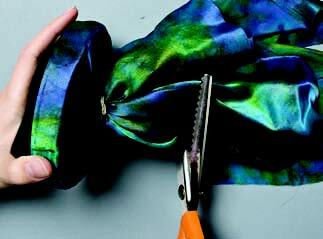 Gather the silk satin fabric in one hand over the glued edge, evenly distributing the fabric around the lid. Secure the fabric with a rubber band in the center of the top of the lid. When the glue is dry, use pinking shears or other edging scissors and trim away the excess fabric in the center of the lid top. Trim the fabric to about 1⁄4˝ from the lid edges, leaving a nice flounce. Remove the fabric from the inside of the lid, trimming the fabric along the glued edge with a craft knife. Put the lid on the box. Glue the beaded fringe around the lid edge. Glue the tassel fringe on top of the beaded fringe around the lid edge. 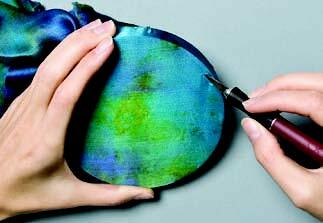 Arrange the flounce on the box lid and glue the velvet leaf spray in place. Glue the decorative pin onto the leaf spray. 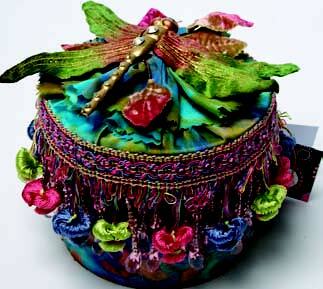 Further embellish the lid and the trims with tiny crystals. Where could i find this self adhesive fabrics? I would like to try making this. This would probably be a nice gift for my cousins. The color combination looks intimate. Also nice gift for a bridal shower.